Those of you who read my post about Apple Muffins with Nutmeg and Cinnamon might remember I mentioned white chocolate muffins recipe back then. 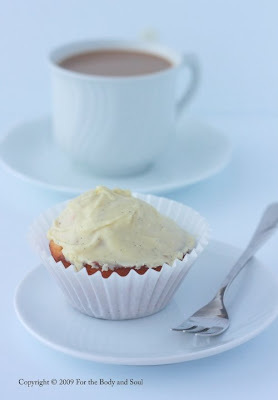 They were one of the first muffins I’ve ever made and, even though I tried lots of different muffin recipes since that time, they have remained my favourite. I love their delicate structure and wonderful white chocolate flavor perfectly balanced with the addition of the lemon peel to the batter. I had never baked anything with white chocolate before this recipe, so it actually made me discover how delicious white chocolate can be when used in baked goods. The original recipe for the muffins comes from : Le codron Bleu Home Collection: Muffins. The addition of vanilla to the batter as well as the icing are my own ideas. Enjoy!!! 1. Preheat the oven to 210°C (410°F). Grease or line muffin pan with paper muffin cups. 2. Sift all the dry ingredients except white chocolate into a large bowl. 3. Chop the chocolate roughly. Add to the dry ingredients. 4. Split half of the vanilla pod lengthways, scrape out the seeds. 5. In a small bowl, whisk together the eggs and milk. Add the lemon peel and vanilla seeds. 6. Pour the egg mixture and melted butter into the bowl with dry ingredients. Stir with a metal spoon to combine. Do not over mix!!! 7. Spoon into the muffin pan filling ¾ full. 8. Bake for 20 minutes or until toothpick inserted in a muffin comes out clean. 9. Let cool slightly before removing from the pan. Serve warm or cold with the white chocolate icing. Break the white chocolate bars into pieces. Melt with olive oil and vanilla seeds in a heatproof dish over a pan of simmering water. Spread over cooled muffins. Let the icing set slightly before serving. You mean the Cordon Bleu muffin book! I have that book too! Your version looks so appetizing!! can I have 1 or 2 or 3 with my afternoon tea?